The sVGP and recent ballast water treatment system approvals create another headache for small vessel owners. Steve Candito provides a primer. The long delayed Small Vessel General Permit (sVGP) legislation is scheduled to come into force on December 18, 2017. Despite some confusion and inconsistencies on this issue generally, there is currently no serious effort to delay the sVGP requirement. Thus, vessel owners should be preparing now for compliance. Although the deadline is still months away, the complacency that permeates the Vessel General Permit (VGP) issue, the related ballast water management requirements and the proposed Vessel Incidental Discharge Act (VIDA) can easily distract vessel owners from taking timely action. Those owners that remain vigilant will be able to comply with non-ballast water sVGP requirements without significant difficulty, but those owners that do not act judiciously and rely on the passage of VIDA to alleviate this “headache” may find themselves scrambling to avoid vessel delays and potentially fines and other penalties. The Environmental Protection Agency (EPA) first issued the VGP requirement back in 2008 and subsequently reissued it in 2013. The VGP provides for National Pollutant Discharge Elimination System (NPDES) permit coverage for incidental discharges into waters of the US from commercial (non-military and non-recreational) vessels greater than 79 feet in length and for ballast water from commercial vessels of all sizes. The EPA estimates that approximately 61,000 domestically flagged commercial vessels and approximately 8,000 foreign flagged vessels require VGP coverage for such incidental discharges. For commercial vessels of 79 feet or less, the EPA's sVGP program applies. The EPA issued the sVGP regulations on September 10, 2014. The initial sVGP program was to be effective for five years between December 19, 2014 and December 18, 2019. Similar to VGP, the sVGP program authorizes discharges incidental to the normal operation of commercial vessels less than 79 feet, including commercial fishing vessels. However, the Howard Coble Coast Guard and Maritime Transportation Act of 2014 (Senate bill S.2444, P.L. 113-281), which was enacted after issuance of the 2014 sVGP requirement, included an exemption for all incidental discharges from these “small” vessels, with the exception of ballast water, from having to obtain a Clean Water Act (CWA) sVGP until December 18, 2017. The 2014 Maritime Transportation Act also exempted commercial fishing vessels of all sizes from having to obtain NPDES permits for those incidental discharges, except ballast water, until December 18, 2017. As a result, until December 18, 2017, sVGP requirements only apply to discharges of ballast water from commercial vessels less than 79 feet, including all commercial fishing vessels. 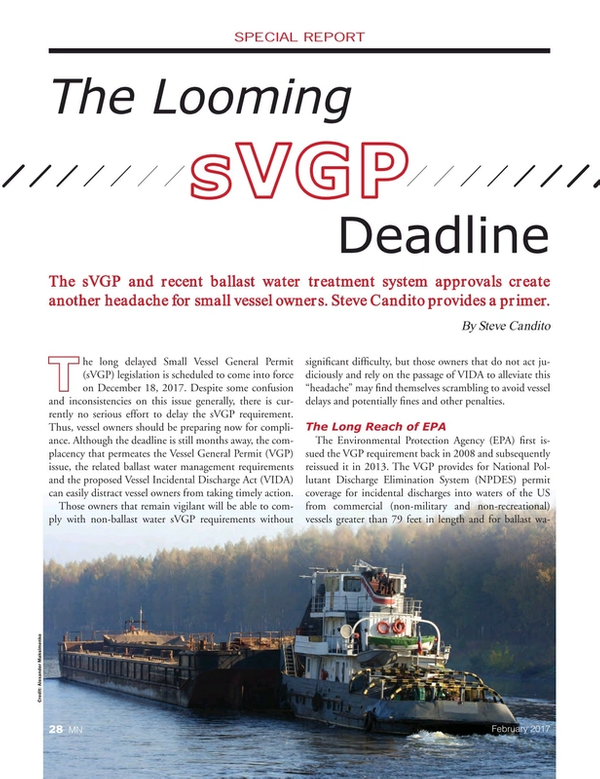 Given this long delay, and similar delays with the additional Ballast Water Treatment (BWT) requirements, many vessel owners deferred taking action on sVGP compliance. Now, with US Coast Guard (USCG) approval of three different BWT systems and uncertainty with the proposed VIDA solution, delaying compliance with the sVGP’s December 18, 2017 deadline is no longer an option. It is important to note that the VGP and sVGP requirements are very different. The EPA recognizes that small commercial vessels are substantially different in how they operate than their larger counterparts, and as such, the sVGP is much shorter and simpler than the VGP. The sVGP specifies best management practices for several broad discharge management categories including fuel management, engine and oil control, solid and liquid waste maintenance, graywater management, fish hold effluent management, and ballast water management. Vessel discharges eligible for coverage under the sVGP are not subject to specific numeric limits, but still must be minimized or eliminated to the extent achievable using control measures including Best Management Practices (BMP) that are technologically available and economically practical and achievable in light of best marine practice. Generally, constituents must not be added to any discharge that is not incidental to the normal operations of a vessel. The term “minimize” is defined by EPA to mean reduce and/or eliminate to the extent achievable using control measures including best management practices that are technologically available and economically practicable and achievable in light of best marine practice. Thus, unlike the ballast water regulations, where until recently there were no technologically approved systems, the sVGP does not require owners to use technology that is not readily available or economically practical. Unlike the VGP, and of significant benefit to small vessel owners, the sVGP does not contain Notice of Intent (NOI) or Annual Report requirements, but quarterly inspections are required to be conducted and recorded on the Permit Authorization and Record of Inspection (PARI) Form. More specifically, there is no exemption for inland workboats and the new SubChapter M regulations do not directly impact the VGP or sVGP requirements. Accordingly, if inland work boats, towing vessels, ferries, etc. are over 79’, they should be complying with VGP now and if they are under 79’ will have to comply with sVGP requirements as of December 18, 2017. Although SubChapter M does not have direct bearing on the sVGP requirements, the Coast Guard’s recent approval of three different BWT systems does have a significant impact since all vessels must comply with the BWT regulations. These BWT approvals now make compliance with the VGP / sVGP possible for ballast discharges. Up until now, the EPA has not enforced the BWT aspects of the VGP/sVGP because there were no approved systems. Interestingly, this anomaly in the regulations has not been challenged legally, even though the BWT standard itself was the focus of a US Second Circuit legal challenge that was decided in 2015. As a result of that legal decision, the EPA was required to reconsider their use of the USCG standard, which some environmental groups alleged was insufficient. That ‘reconsideration’ process is still ongoing at the EPA, but most stakeholders don’t expect the Coast Guard standard to be changed. Rather, it is likely the EPA will simply explain their decision to use the USCG standard including that a more stringent standard is not practical given current technology. Further, this tactic will also allow the EPA to align their ongoing review so it dovetails with the revisit of the Coast Guard standards in 2018. In the meantime, and because of the phase in of the BWT regulations, there will be several years where vessels must comply with all aspects of VGP/sVGP other than BWT and the EPA will likely overlook this BWT non-compliance, something which is not a very comfortable situation for vessel owners. A potential solution has been in the works for a long time, but has still not been passed. The proposed VIDA legislation attempts to unify and simplify both the regulatory and compliance aspects of vessel discharges by creating one federal standard for both the Coast Guard and EPA, while also preempting any similar State regulations. Currently, those regulatory duties are divided among many jurisdictions including the States, the Coast Guard and of course, the EPA. Predictably, VIDA has wide support among vessel owners, labor unions, ports and terminals. Unfortunately, even with this support, it has not made it through Congress yet. Beyond the operational aspects of VIDA, legal uniformity is one of the basic tenets of the law generally and specifically admiralty law so VIDA certainly makes good sense from both a legal and operational perspective. Moreover, the 2015 Second Circuit decision mentioned above heightens the need for Congressional action on VIDA. Although many expect the EPA to simply look to the USCG standard during their reconsideration process, there is a chance that the EPA will go in a different direction increasing the likelihood that new regulations will further exacerbate the misalignment of federal standards and worsen an already untenable situation. In light of all the above, small vessel owners can’t rely on VIDA alleviating this “headache” before the December 18, 2017 sVGP deadline. Thus, they should be taking action now to at least comply with the sVGP’s non-ballast water requirements. Although there may be some risk of not complying with the sVGP’s ballast water requirements as of December 18, 2017, this risk seems reasonable, given the USCG’s formal BWT waiver process. Steven Candito is Founder, President and CEO of Foresea. Foresea provides various advisory services including strategic planning, regulatory compliance and crisis management to the maritime and environmental communities. Prior to his current position, Mr. Candito was President and CEO of NRC. Candito is a graduate of Hofstra University School of Law and the United States Merchant Marine Academy. He is also a past President of the Spill Control Association of American (SCAA).